Sign language, to many, seems too niche and too complicated to be considered useful. If you're not deaf or don't know any deaf people, what's the point, right? To celebrate International Week of the Deaf and International Day of Sign Languages (22-29th September 2018), let's take a look at some of the reasons why you should learn sign language. Nyle DiMarco is an American model, actor, and deaf activist. Nyle won the 22nd season of America's Next Top Model, the first and only deaf contestant to do so. He also won the 22nd season of Dancing with the Stars. Nyle communicates through American Sign Language (ASL), using English as his primary written language. In his most recent TEDx Talk (Sept. 2018), Nyle discusses his experiences growing up in a non-hearing world, and the impact that Sign Language has had on shaping who he is. So, why learn to sign? Firstly, hearing loss is a lot more common than one way believe. Nearly 28 Million Americans have some form of hearing loss. Currently, a small percentage of those can only communicate via sign language, and are forced to stick within the deaf community. One great advantage of learning sign is expanding the social networking of those people, allowing them to further participate in society more easily. 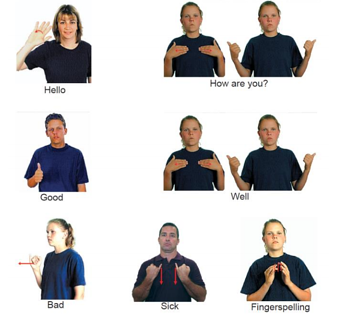 Become more expressive: Sign language is the key to create vivid and lasting imagery. Anyone who enjoys story telling, or making jokes can incorporate sign language to better captivate audiences. Pick up on body language: Given that sign language is a visual language, it's no surprise that you can also learn to better understand body language. Hold silent conversations with friends: Communicate in secret! Whether it be clubs, movie theaters or libraries, you don't need to whisper or yell to talk to your friends in sticky situations. Job Opportunities: There's always space for qualified interpreters! Like knowing any second language, learning sign language opens up new opportunities to expand into careers you may never knew existed. As with any new language, learning sign language can seem complicated. However, there are plenty of resources available online to help you master sign language with ease. Whether you want to learn AUSLAN, or ASL, there's plenty of blogs, posters and video tutorials that breakdown the language into understandable bite sized pieces of information. With many myths and misconceptions about sign language around, it's handy to know that these resources are reliable. To celebrate International Week of the Deaf, let's take a look at some simple posters showcasing AUSLAN phrases and key words anyone should know. Phrases like "Hello", "How are you?" are very simple and can get you started on your sign language journey. Sign Language is also useful for visually displaying numbers. 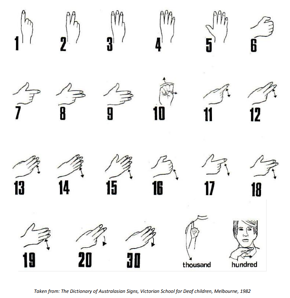 Learn how to count to 30 and beyond with this easy illustration taken from The Deaf Society. Here's our list of reasons people use sign language other than hearing loss. 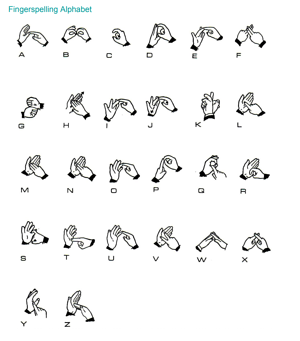 Learn how to sign the alphabet in American Sign Language and sign languages from all over the world. Check out the top 6 myths about sign language debunked!